Relatively speaking, there is a lot of discussion about wasted materials versus the necessary degree of insulation when it comes to paper coffee cups. Cups and sleeves made of recycled materials are great, but when the cups and sleeves are made thinner in an attempt to use fewer resources, many consumers feel the need to double cup – and sometimes add a sleeve on top of that. 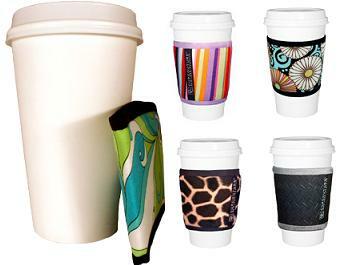 The best solution is probably a reusable cup, but following that, a reusable sleeve that can fit easily into a pocket or handbag is an excellent choice. Save the environment and your fingertips, right? These Cup coats from Cup Couture come in a tremendous number of cute (and masculine) patterns, are very thin, reusable and will probably work out better than even a thick paper sleeve. I think they’re especially good for travelling, as some cities (and countries) seem to be a little less likely to provide sleeves or double-cups to begin with. They make really cute gifts, too.